The Family Holiday Gift List is a unique way to organize and plan your holiday shopping for the upcoming season of giving! This quick and efficient template provides you with all the tools you need to master your holiday shopping and track the amount of money you spend this year. You never have to lose track of another gift with this comprehensive Gift List sheet. The holidays should be a time to enjoy with all your friends and family, so why not take the hassle out of the boring aspects of holiday shopping? Download this absolutely free template and you’ll be well on your way to spending this season with the people you love! Click the link located at the bottom of this page to get started. Once you have the document open, you can begin to change the information to make the template better suited for your unique shopping needs. Start by entering the list of people you want to buy a gift in the “Name” column to the far left of the page. 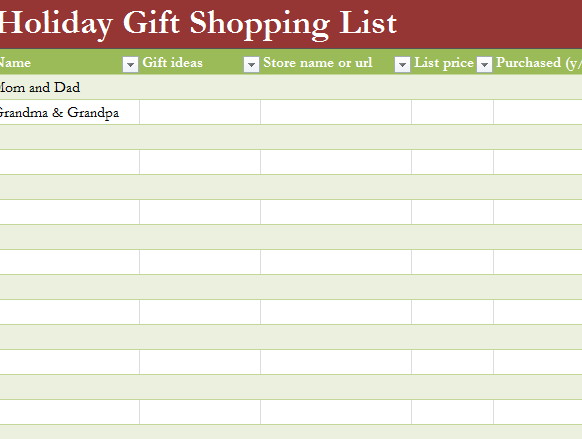 Once you have your list of names, you can start adding your gift idea in the next column, “Gift Ideas”. There is also a space to enter the location of the store that carries your item and the URL of a website, in case you want to buy your gift online. The last three columns merely provide you with a way to mark if your gift has been purchased, wrapped, and if it will require shipping. In these columns, you simply enter a “Yes” or “No” to verify. Once you have entered all your shopping items into the document, you can print! Just press the file button at the top of your screen and select “Print” from the drop-down menu. Make the holidays special again. Use this shopping list to find the best gift for your loved ones!